Lyon's main train station, at 5 Place Charles Béraudier, 2.5 km (1.5 miles) east of Place Bellecour (map), serves fast long-distance TGV trains as well as regional TER Rhône-Alpes trains. The station is connected to the rest of Lyon by Métro Line B, the Rhônexpress train from Aéroport Lyon Saint-Exupéry, and trams T1, T3 and T4. Many fast TGV trains arrive and depart at Lyon's newest train station, the Gare de Lyon Saint-Exupéry TGV within the Aéroport Lyon-Saint-Exupéry, 30 km (19 miles) east of Lyon's Place Bellecour (map). 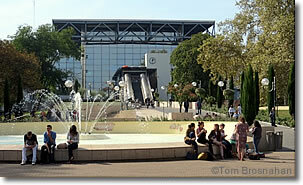 The TGV station is 300 meters (328 yards) west of the main airport terminal. Tram RX connects the airport TGV station with the city center. This city-center train station at 14 Cours de Verdun, 1.2 km (3/4 mile) southwest of Place Bellecour along rue Victor-Hugo (map), serves local, regional and some national trains, though most TGV trains arrive and depart at Lyon's other two train stations. 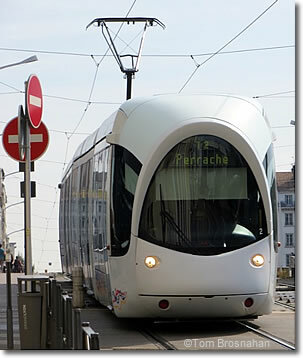 TCL is the organization that operates Lyon's four Métro, five tramway lines, two funiculars, and more than 130 city bus routes. A TCL ticket is valid for one hour in one direction, and takes you anywhere you want to go on the system, by any means. Just remember that you must validate your ticket whenever you board the TCL system, and every time you change from one mode of transport to another (except when you change Métro lines).